And why not? 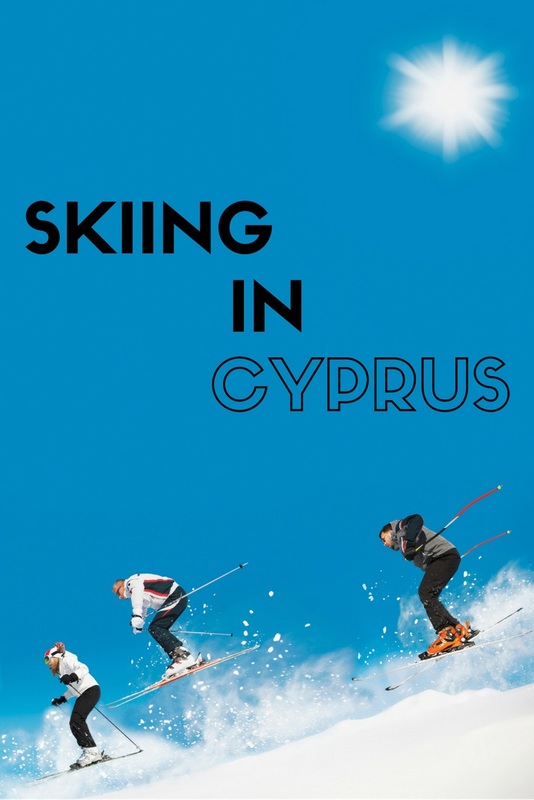 Sunny Cyprus is perhaps not the most obvious place to ski – but if you are looking for the unusual – if only to tell your friends and family about it when you get back home – then a skiing holiday in Cyprus could be perfect. -5C at night and around 4C during the day with snow coverage reaching as much as 2 metres on lower slopes, rising to 2.5 metres on the mountain ranges’ highest peak, Mount Olympus. Keep an eye on the Troodos web cam for the current snow conditions but don’t be fooled: the snow melts much quicker on the south facing slopes, so just because you can’t see snow when you look up from the south, it doesn’t necessarily mean there is no snow. Head to just below the highest peak of the Troodos at 1,900 metres and on to Troodos Square. You will then find a ski hut just below Mount Olympus at Sun Valley where there’s a ski hire shop and you can buy a full day or half day ski pass. A ski holiday in Cyprus is surprisingly inexpensive; in fact, the island is one of the cheapest skiing destinations in Europe – you can get away with a day’s skiing for around 20 euros. The Cyprus Ski Club on Mount Olympus is the centre of all skiing activity in the Troodos range with four main slopes to choose from varying in accordance with skiing ability. You’ll be glad to know that each one has its own ski lift which should cut down on queuing time. Troodos Square is the closest resort to the Ski Club with two well equipped hotels and a row of tourist-focused shops to keep most skiers happy for a few days. 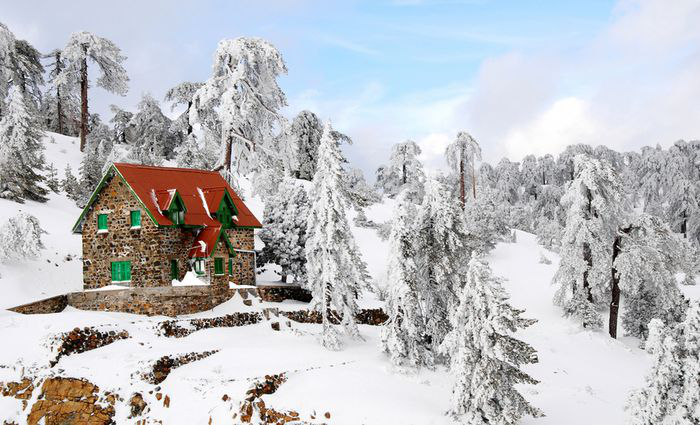 Platres is the biggest of the Troodos resorts, located on the southern slopes 8km from the Ski Club. Platres is one of the island’s Krasochoria (wine villages), despite many of the vineyards being changed to orchards for growing fruit trees. If the snow doesn’t settle, there’s plenty of beautiful waterfall-laden nature trails and cycling routes to keep you busy. Pedoulas lies 17km from the Ski Club in the Marathasa valley and is endowed with pretty nature trails through the surrounding pine woods and cherry trees. There’s a bit of culture to be enjoyed in the area thanks to the local Byzantine and Folkloric Museums and the Chapel of Archangel Michael. Kakopetria is a little further out (20km to Troodos Square) compared to the previous resorts but is perhaps the most beautiful. Surrounded by thick forest and facing the Troodos range, the village is built along the banks of two rivers which unite in its centre to form the Klarios River. The Old Village is worth strolling through and the water and olive mills as well as the Linos Museum are worth exploring. Not sure whether to take a ski break or a beach holiday? If you need a little more downtime off-piste or want a bit of culture, Cyprus is ideal. Few other places give you the chance to ski in the morning and sunbathe by the pool or on the beach in the afternoon. Aside from a host of beaches along Cyprus’ stunning coastline and an average winter temperature of 21 degrees at sea level, two of Cyprus cultural hubs are within striking distance of the ski resorts. Lemesos (known to many as Limassol) is the hub of business in Cyprus and lies within an hour’s drive of the ski resorts. The characterful city wraps itself around a storied castle and an old town which radiates charm and buzzes with café culture. Cyprus’ capital Nocosia (Lefkosia to the Greeks) is also a short trip down the road from Mount Olympus. The city’s ancient wall are home to the excellent national museum which brims the islands best archaeological finds as well as sumptuous traditional restaurants and a fascinating collection of churches and mosques.